GOVERNMENT: Independence from France, 1960. Multiparty republic; president elected by universal suffrage. Governing bodies: Council of Ministers appointed by president. Located in a broad, rolling plateau just north of the equator, the Central African Republic varies from tropical rain forest in the southwest to savanna woodlands in the northeast. Although most of the country receives abundant rainfall, the extreme—and very dry—northeast receives only about 0.2 inches annually. The Oubangui River, the most important waterway, runs past Bangui, the capital, and along the nation’s southern border. The Central African Republic contains immense natural resources that could easily make it one of the richest countries in Africa. These resources include fertile land, plentiful wildlife and timber, and extensive mineral deposits. However, partly as a result of poor economic planning, the nation has not fully benefited from its rich resources. In spite of its fertile land and reliable rainfall, the Central African Republic imports more food than it exports. About 80 percent of the inhabitants work in agriculture—mostly subsistence farming. The main export crops are cotton, coffee, and tobacco. Central Africans also raise cattle, sheep, goats, and pigs, except in areas where the tsetse fly—an insect that spreads disease—is found. Mining in the Central African Republic focuses on gold and diamonds, with diamonds producing over half of export revenues. The country also has rich reserves of copper, uranium, iron, and other minerals. The timber industry processes hardwood from the tropical rain forests. Light industries include food processing, breweries, textiles, and footwear. Petroleum and durable goods such as appliances and automobiles are imported. Because the cost of imports exceeds revenues from exports, the country is deeply in debt. The poor infrastructure of the Central African Republic limits economic growth. The nation has no railroad and a critical shortage of good roads. Less than 5 percent of the existing roads are paved. In addition, the health care system is poor. Although tropical diseases are widespread and epidemics occur frequently, the country has only one major hospital, in the city of Bangui. Before the arrival of Europeans in the late 1800s, the region that is now the Central African Republic was frequently invaded by Islamic slave raiders from the north. Weakened by the slave raids, the local population was unable to oppose the European merchants and settlers who followed. In 1894 France established a colony in the region, known as Oubangui-Chari. The French forced the indigenous people to work for them, to perform military service, and to pay taxes. Farmers had to grow cash crops such as cotton instead of the food crops they needed to survive. These policies, as well as cruel treatment of local inhabitants by the French, led to uprisings in 1909 through 1911 and again from 1928 to 1945. 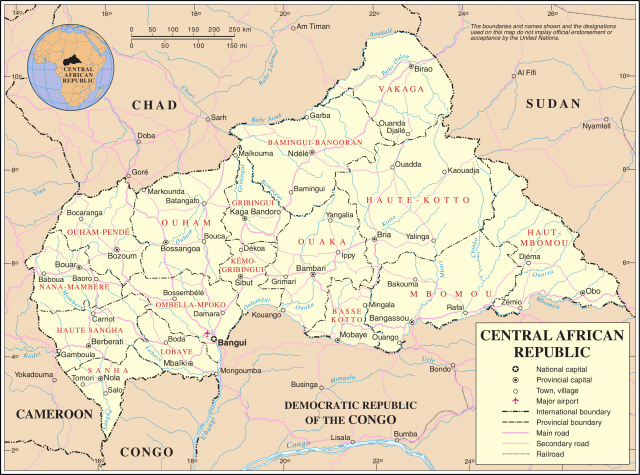 In 1960 France granted independence to the colony, which took the name Central African Republic. David Dacko, the country’s first president, introduced a single-party system of government. In 1966 Dacko was overthrown by Captain Jean-Bédel BOKASSA, who committed brutal acts against civilians and squandered much of the nation’s wealth. In 1977 Bokassa proclaimed himself emperor of the newly renamed Central African Empire. Two years later, his government—already very unpopular—reached a crisis. Riots broke out in Bangui. French troops took over the airport and the capital, and restored David Dacko to power. In 1981 Dacko was forced to cede power to General André Dieudonné Kolingba, who suspended the constitution and assumed absolute authority over the government. After a failed military coup the following year, Kolingba’s rule became even harsher. He introduced a new constitution in 1986 and was elected for another six-year term as president. A poor economy forced Kolingba to cut spending. In addition, the government fell behind in paying civil servants’ salaries. These difficulties and Kolingba’s harsh policies led to riots and strikes. As the result of elections held in 1993, Ange-Félix Patassé became president. Since that time, violence has broken out over living conditions and a lack of representation for opposition parties. The Central African president continues to hold considerable power. As head of state and commander of the armed forces, the president appoints the prime minister and the members of the Council of Ministers. There is an elected legislature, but the president has the power to dissolve it and call for new elections. The Central African Republic is home to about 3.5 million people, and more than 40 percent of them are under 15 years of age. Almost half of the inhabitants live in cities and towns such as Bangui. Of the eight major ethnic groups in the Central African Republic, the largest are the Banda and the Baya (or Gbaya). Other groups include the Mbum, the Zande, and the Aka (or Bibinga), a Pygmy people. Although the role of traditional leaders diminished during the era of French control, ethnic identity is still strong, particularly in the countryside. French is the official language and most of the population speaks Sango, a Bantu language.